Published by Cyril Huze March 7th, 2018	in Accessories and Customs. 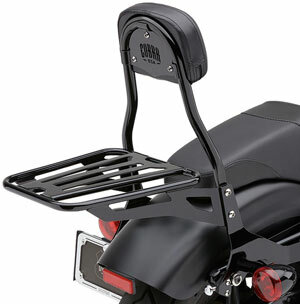 Detachable Back Rests and Racks are extremely popular accessories to adapt your bike to the type of riding you decide. Cruising or traveling solo or 2-up, these product can be added or removed with the single pull of a lever. 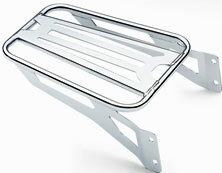 Offered for Baggers®, Sportsters®, Dynas® and Softails®, in chrome or black, the Racks come with the side rails, bar, pad and insert, all in one box. The Bagger version also has its own fully detachable Rack. All the others use a Cobra rack that bolts to the backrest and removes with it. All mounting/docking hardware is included. See your local V-Twin dealer. Cobra USA. I see Cobra worked from Harley’s design flaws and made smaller side plates to mount the sissy bar so as the side plate does not affect the passengers comfort when leaning against the backrest like Harley’s does. I still bungee to my handlebars and don’t believe in sissy bars … My girl rides with me cuz sometimes I really have to move! !